Marvel Comics is doing Secret Wars again. That means big drama is about to hit for Iron Man, Hulk, the X-Men and the publisher’s other superheroes. Everything will change in significant ways. You might even understand some of it. First, a warning: Secret Wars #1 by Jonathan Hickman and Esad Ribic is not the kind of comics that lapsed fans or curious newcomers will be able to digest on its own. This debut issue is an extension of the huge, multivalent narrative that Hickman’s been spinning for years in Marvel’s Avengers books. To try and sum it up quickly: There used to be millions of parallel earths in the Marvel Universe. All of existence is ending and various factions of superheroes have been trying to save it in ideologically opposed ways. Some have battled against alien invaders in public, while others have engaged in more clandestine and morally grey actions to the same end. None of it matters, though, because the end of everything appears to be implacably on course. There are two versions of Earth left, fighting each other for the right to exist. Heroes like Iron Man, Hulk and Nick Fury will likely need to kill each other and/or die. The bigger plot beats maintain the themes from Hickman’s Avengers run: seemingly futile acts of heroism, super-smart characters with hidden agendas and motives, and desperate struggle against inevitable oblivion. The two remaining Earths represent the older, mainstream Marvel continuity and its modern-day re-imagination that began 15 years ago. It looks like one Earth—the mainline one called 616 where the original versions of Spider-Man and the X-Men live— is going to win out. The native reality simply has more superheroes than the newer, doppelganger Earth-1610, which is the home of more recent iterations of Marvel’s metahumans (like younger Spider-Man Miles Morales). Then, that planet’s evil Reed Richards pulls a rabbit out of his high-tech helmet and people start disappearing in the heat of battle. It’s a beat that pays homage to the original Secret Wars from 1984, which collected heroes and villains for a cosmic brawl on a far-off planet. The 1984 Secret Wars seemingly just dropped out of the sky from nowhere, with very little by way of build-up to the crazy superhero conflict that followed. The catch with this Secret Wars event is that you need to be invested in a long skein of stories to understand why the end of a multiverse is about to happen. And, because modern comics publishing practically requires reading a slew of spin-off stories tethered to a big new release, more investment will be aggressively courted, too. Marvel’s going to be pumping out miniseries that mash up various histories and alternate realities. Completionists will be lucky to avoid going broke. Even though it wasn’t a cosmic reset, the Secret Wars of 31 years ago altered the fabric of the Marvel Universe. Spider-Man got a new costume. The Thing didn’t return to Earth with his Fantastic Four partners. New villains were created. 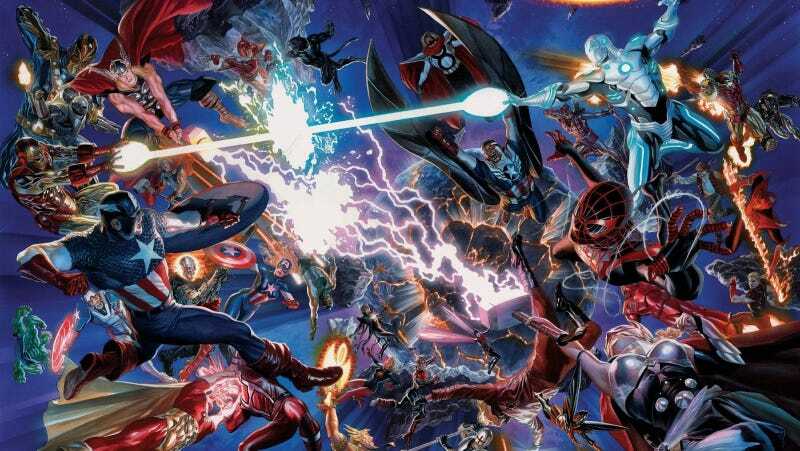 Things changed as a result of the original Secret Wars, and the same will happen after its spiritual successor is done. Part of the outcome of the current Secret Wars event has already been shown in a Free Comic Book Day one-shot Marvel put out last Saturday. An Avengers story from that comic debuts the coming line-up of the publisher’s premier super-team, which includes Miles Morales. While we know that he and the other Avengers survives, we don’t know what kind of timeline or world, they’ll inherit. Some of the fun of reading modern superhero comics is in untangling or forecasting all this stuff. It’s hard, though, not to yearn for a simpler time, especially when homages to days past are in the comics of today.